45 years of Nelson Enterprises catalog offerings. 5846 total items appearing in those catalogs. 2476 total pages are summarized in this Master Index. 1276 separate effects, books, appear in this Master Index. 125 pages are in this Master Index. Zero excuses for not owning your own copy. Just before the Master Index went to press, a decision was made to also reference every item and book in the first-ever Nelson Magic Catalog of 1946. Now the Index is an even more complete tool for the mentalist and magician. This monumental work presents the modern mentalist, collector and magic buff with a complete index of effects, books and services offered in the Nelson catalogs from Catalog Six (1927) through the final Catalog, Number 31 (1972). Use it to verify Nelson items you are offering for sale, to buy, or as a research tool for determining the creator of vintage mental and magic effects. But wait, there's more. 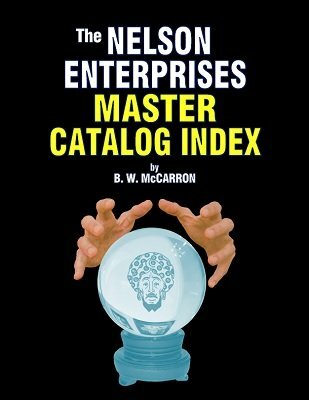 The Nelson Enterprises Master Catalog also includes valuable advice on how to grow and curate your Nelson collection. There's even information on acquiring certain public domain titles, formerly sold in the Nelson catalogs, free of charge. We couldn't finish the Index without including front cover photos of the 21 Nelson catalogs represented, along with brief thumbnail sketches about each one. How robust is your Nelson collection? You may have missed several items that were published in only a single catalog over the years. Now you can locate that item, down to the particular catalog and page number where it is found ... even if you don't own the original catalog. Looking to buy a Nelson item offered at online auction? Know before you buy. Check to make sure it's the real thing by verifying it against this mammoth cross-reference index, with not one, but two separate indexes - one arranged by title and the other by Nelson stock number. And, the entire file is searchable, too, using Adobe Acrobat or other PDF viewer. Some of the manufacturers and publishers of the effects and books represented in the Index, in addition to the Nelson Enterprises, include Abbott's, Grant, Haines, Owen, Petrie-Lewis, Reilly, Snyder, Thayer, and more. 1st edition 2018, 125 pages + supplement.